€1,000,000 in combined guaranteed prizes up for grabs in Mini and High Events! Compete in High and Mini Events with a wide array of buy-ins and huge guaranteed prizes, from April 18th to May 8th, 2016. Whether you buy in big or buy in small, you'll be competing for massive prizes in the iPOPS X events! On Monday April 18th 2016, 2 weeks' worth of tournaments kick off with a wide variety of buy-ins as low as €1 and guaranteed prize pools as high as €250,000. Buy in directly or play your way into an iPOPS X Main Event via satellites starting on Monday April 11th, 2016. Buy-ins start at just €0.20! 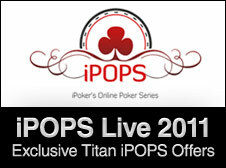 For a full list of iPOPS X events and iPOPS X satellite poker tournaments, click on the 'iPOPS X' tab in the software. Titan Poker reserves the right to exclude players who participate in the promotion with multiple accounts. Satellites will award tokens which can only be used in iPOPS X related tournaments whilst the promotion is in progress. Some iPOPS Main Events will replace similar regular network tournaments on the date of the Main Event. General satellite terms and conditions apply. The iPoker Network, considered the best poker network in the world, stages a regular series of online poker tournaments every year. iPoker's Online Poker Series (iPOPS) attracts all types of poker enthusiasts and awards upwards of $1,000,000 in guaranteed prizes during each series. Listed below is information about the previous iPOPS tournaments held and the role Titan Poker players played in leading their success. Come one, come all and compete for big guaranteed prizes no matter how big your bankroll! Starting March 28th, 2016 enjoy a week's worth of tournaments with a wide variety of buy-ins as low as €0.20 and guaranteed prize pools as high as €50,000. 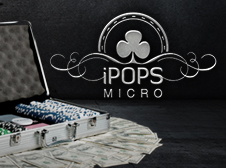 Buy-in directly or play your way into an iPOPS Micro Main Event via satellites starting on Monday March 21st, 2016. Extra Bonus Offer: Play for FREE in the daily iPOPS-M €100 Gtd Freebuy every day from March 28th - April 3rd, 2016 at 20:30 GMT for a chance to collect even more prizes! Large Bankroll? Small Bankroll? Everyone has a spot in the iPOPS IX events! Starting Monday October 19th 2015, iPOPS launches 2 weeks of tournaments with a wide variety of buy-ins as low as €1 and guaranteed prize pools as high as €250,000. Play your way into an iPOPS IX Main Event via satellites starting on Monday October 12th, 2015. Buy-ins start at just €0.20! Play in the iPOPS Micro, running from September 28th to October 4th, and enjoy a week's worth of tournaments with a total of €100,000 in guaranteed prizes. Buy-in directly for as low as €0.20 or earn your entry via satellites starting Monday, September 21st. As an added bonus, there will also be a €100 Gtd. Freebuy tournament running every day during the week of the Main Events! iPOPS has returned and is bigger and better than ever! Between April 20th - May 10th, over €1 million in guaranteed prizes will be awarded, including €20,000 in "Viva Las Vegas!" prizes in the Viva Las Vegas! Leaderboards. With a schedule consisting of Mini and High Events, there is a game suited for poker playerers of all shapes and sizes. Buy-in for as low as €1 and play for massive prize pools of up to €300,000! 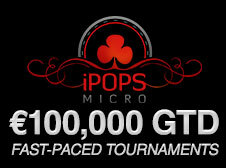 The week-long, fast-paced iPOPS Micro tournaments return in 2015, with over €100,000 in guaranteed prizes on offer. Buy in directly to the 21 iPOPS Micro Main Events running from February 23rd - March 1st for as little as €0.20, or earn your seat via satellites starting February 16th. Place as one of the top 25 finishers in the iPOPS-M €50K - 25 Tokens satellite tournament on February 28th, and you'll get free entry to the €50,000 Guaranteed Main Event on March 1st! 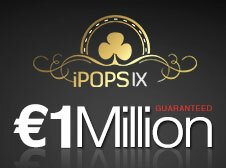 The seventh edition of iPOPS (iPoker Online Poker Series) commences this October and guarantees €1 MILLION in prizes! Buy into the Mini Events taking place from October 20th - October 26th for as little as €1! High Events begin November 2nd and conclude with the €300,000 Guaranteed Main Event on November 9th. Additionally, main event tokens are up for grabs in our iPOPS VII Mega Satellites starting on October 25th. We're proud to announce the first time ever iPOPS Micro tournaments. Join the week-long series of fast-paced, micro-sized buy-in tournaments guaranteeing over €100,000 in prizes. 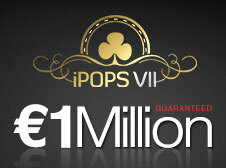 iPOPS Micro Series Main Events run from September 15th to 21st, and buy-ins start from just €0.20! Satellites for the iPOPS Micro tournaments begin September 8th. iPOPS is back for its sixth series of exciting online poker tournaments, this time with a total guarantee of €1,000,000 in prizes! Returning to the series are iPOPS High Events and Low Events. Join the action for buy-ins as low as €1, or dive-in head first against the big players in the €300,000 Guaranteed Main Event. Low Events take place from April 13th - 20th. 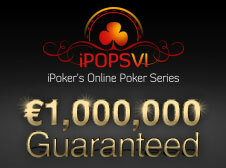 High Events start on May 4th, and culminate with the €300,000 Guaranteed iPOPS VI Main Event on May 11th. 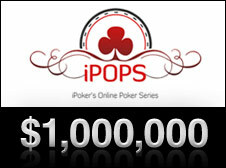 The iPoker Online Poker Series (iPOPS) is back for its fifth series and is bigger and badder than ever before. With buy-ins as low as $1+$0.1, you could win a share of $1,250,000 guaranteed! No matter if you're a seasoned poker veteran or a casual player, the iPOPS 2013 tournament series offers Major Events and Mini Events that cater to players of all kinds. iPOPS poker Mini Events run from November 16th - 23rd, and Major Events start November 24th and ends with the $400,000 guaranteed Main Event on December 1st. iPOPS returns, bigger and better than ever. 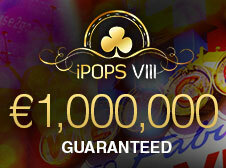 With $1,200,000 in total guaranteed prizes, this time around iPOPS provides tournaments for players of every bankroll. The series includes 15 separate events, divided into a Side Events Series and a Major Events Series. The Side Events include a tournament with a $2+$0.20 buy-in. The Major Events Series includes seven feature tournaments and concludes with the $500,000 Guaranteed Main Event on May 5th. As an incentive, every player who finishes at a final table during the Side Events Series will receive a free entry to the $500,000 Guaranteed tournament. The popular iPOPS series returns as five online events between November 25th and December 2nd, 2012, once again with a total guaranteed prize pool of $1,000,000. The series has been optimized with a more attractive structure. 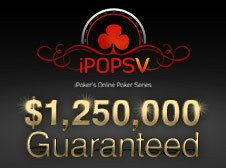 The prize pool at iPOPS #5 on December 2nd has been set at $550,000. Low-priced satellites launch to all 5 tournaments on October 22, 2012. The second iPOPS took place as five online events between April 29th and May 6th, 2012, with a total guaranteed prize pool of $1,000,000. The final online tournament, iPOPS #5 $500,000 GP, was paused when only 27 players remained and the action resumed and finished in Barcelona. Barcelona was also host to the iPOPS Live Main Event. The inaugural iPOPS took place as four online events between November 28th and December 4th, 2011, with a total guaranteed prize pool of $1,000,000. The fourth online tournament, iPOPS #4 $500,000 GP, was paused when only 27 players remained and the action resumed and finished in Prague. Prague also played host to the first iPOPS Live Main Event.